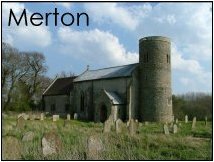 Leaving the town of Watton and heading south, you have to skirt an area of Norfolk that, to all intents and purposes, does not even exist. 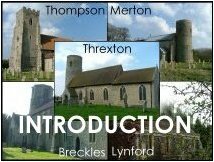 This is the Norfolk battle training area, whose churches have already been featured on this site. Before the 1940s, the training area was just another part of the vastness of rural Norfolk, and this now-closed zone formed part of an organic whole with the villages that are still inhabited. Tottington, within the zone, was the near-neighbour of Thompson, the two villages inextricably linked by the entwining lanes that drew them together. The churches are almost twins, although Tottington's is much the grander on account of its aisles and clerestory. Nobody has lived in Tottington for sixty years or more, and the church is virtually all that remains of the former settlement. The public will never be given access to the parish again, and this site is one of the few places on the internet or in books that you can even see pictures of it. 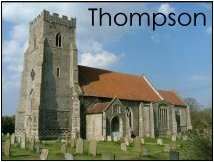 But Thompson continues its quiet, backwater life, with a sense that, despite the arrival of the 21st century, not a lot happens here. Indeed, not a great deal has happened in Thompson for a very long time, not since the 16th century Reformation put paid to its college of Priests. Some of the college buildings still exist, and the Priests' stalls remain in the chancel of the church. In the main, much has survived here, both from the medieval days and the quieter 17th and 18th centuries. Thompson remains outside of the hubbub. The same cannot be said of Merton, a mile to the north. Merton Hall was the home of Lord Walsingham, owner of the Tottington estate and emploer of almost everyone who was evacuated from the zone in 1944. In the 19th century, the family paid for the elaborate refurbishment of Merton church, including the ugly, pompous private porch that still faces the Hall, which later became a school. Still, even here much has survived. 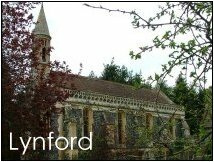 I find Merton church incongruous; its primitive round tower makes it seem the kind of building you should find hidden in the woods, not set down in polite parkland. As you head away from Thompson, you feel the training area fall away behind you. The landscape changes; you are leaving the Breckland, and hills and woods begin to take the place of the flat, sandy heathland. 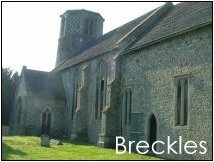 At Breckles are two delightful surprises; the Hall and the round-towered church, with its extraordinary font. 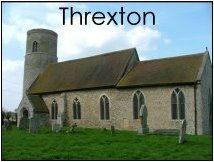 There is a third round-towered church on this side of the zone, at Threxton, a quiet, welcoming building on the edge of a farm; well-kept, Victorianised, but retaining extensive medieval wall decorations. To the south are Wretham, which is not on this site yet, and the incongruous Catholic church at Lynford, built as a private chapel by the fabulously wealthy Lyne-Stephens family. Directly between the two is Pugin's magnificent rebuilding of St Mary, West Tofts - but that is within the battlezone, and consequenty long-since abandoned.